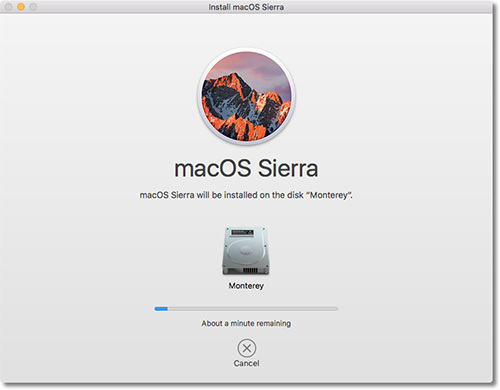 We only installed El Capitan in July of last year so we may be accused of rushing things with our installation of Sierra only nine months later. Enthusiasm wasn't the reason. As with El Capitan, we'd be hard pressed to list any compelling features prompting the move. There hasn't even been an Apple Raw compatibility update since June of last year. The factor that did prompt us finally was that we wanted to have a Sierra machine to be able to support one family member who just installed a 27-inch iMac. Running Sierra of course. But we're still not convinced to make the jump on our main production machine. Once again we've read of problems with the Wacom drivers. And while that didn't affect us with our move to El Capitan, we know our days are numbered. We've had this Intuos in our right hand since 2001 and we'd be lost without it. Then, too, this update, unfortunately, wasn't as smooth as the El Capitan update, although we have to say (in the same sentence) that things stabilized immediately after we did one little thing. We started the update around noon on a rainy Tuesday. It had already downloaded so it just needed to install itself. By the time the installation had finished, which was a quarter to two, the sun had come out. We were remarkably civilized about the whole thing. We just relaunched the App Store. We logged in, did the iCloud setup dance, got the traditional CS5ServicesManager needs Java SE 6 dialog (as well as a notice about some out-of-date Project Gutenberg stuff) and, after a little disk thrashing, got our familiar desktop on the screen. We tested our ExifTool tools first. One implementation failed but another worked. Interarchy (the FTP software which updates the public site from our local copy) crashed on launch repeatedly. The Wacom driver (with no tablet attached) kept hogging the CPU until we force-quit it. Trackpad gestures were not obeyed. Apache, of course, had to be reconfigured to run PHP, which we do after every new install. But this time, it failed to find localhost, which is where everything is on our local machine. And BBEdit and TextWrangler threw up some bizarre Open File dialog boxes where the layout seemed to be confused on several fronts. We remained remarkably civilized about the whole thing. Rather than fume in our antique office chair, we just relaunched the App Store. We quickly discovered that we had only installed version 10.12 of Sierra, the original release. We wanted the current version, which is 10.12.4. We'd waited for all of its improvements, after all. But unfathomably that has become a manual process. If you aren't going to install the current version, you should be sure to automatically install any updates (you know, before anyone notices). Right? Anyway, after doing that one little thing, everything stabilized. Interarchy ran just as nicely as always, BBEdit and TextWrangler showed us the old Open File dialogs again, Apache found localhost and, after installing Java SE 5 (and updating Java) we could even run the last Adobe applications we can be said to own. We were even able to print an image from both Apple Photos and Photoshop CC to the DNP DS620. But still we'll wait to update our main machine until we have an idle weekend to reinstall El Capitan if things somehow don't work out on that older MacBook Pro. Update (23 April): After a couple of days with no issues, we decided to do the Sierra update on our main production machine Saturday. That would give us two days to work things out and, if we didn't, we'd already confirmed our 13-inch laptop could let us get to work. So after publishing the Saturday matinee, we did a final backup of El Capitan and ran Disk Utility to make sure the hard disk was healthy. No issues there. Then we did the Sierra install. This eventually entailed a series of installations before we did any configuration or work. There was macOS 10.12 followed immediately by 10.12.4, the associated Apple apps (iLife, iTunes, Apple Remote Desktop, etc. ), Xcode itself (which is so large we think of it separately from the other Apple apps) and the Creative Cloud spring video updates. That took all day. By then, we had run the Java SE 5 install for older Adobe apps and copied over our old Apache configuration (which enables PHP and localhost). We can't tell you how happy we were to find the Wacom Intuos still happily skimming over the screen. And we haven't seen a blip yet. It's business as usual with everything where we left it. The key to this much smoother update was simply installing macOS 12.10.4 over 12.10 immediately. Update (28 May): After running Sierra for a month, we've only found two persistent issues, both of which we have to call bugs. First, the F5/F6 functions to adjust screen brightness are simply broken (whether you use them with or without with Function key modifier. The only way to change screen brightness is to access the System Preferences Display module. Second, idle sleep is immediately terminated when a Wacom Intuos mouse remains face down on the tablet. Turn the mouse on its side or move it to off the active area of the tablet and the Mac will stay asleep.